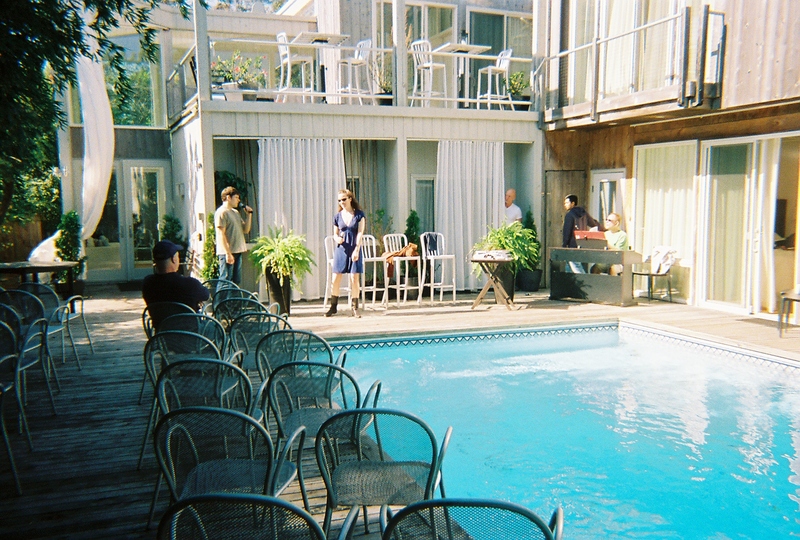 5th Annual Fire Island Theater and Literary Fest a Success! 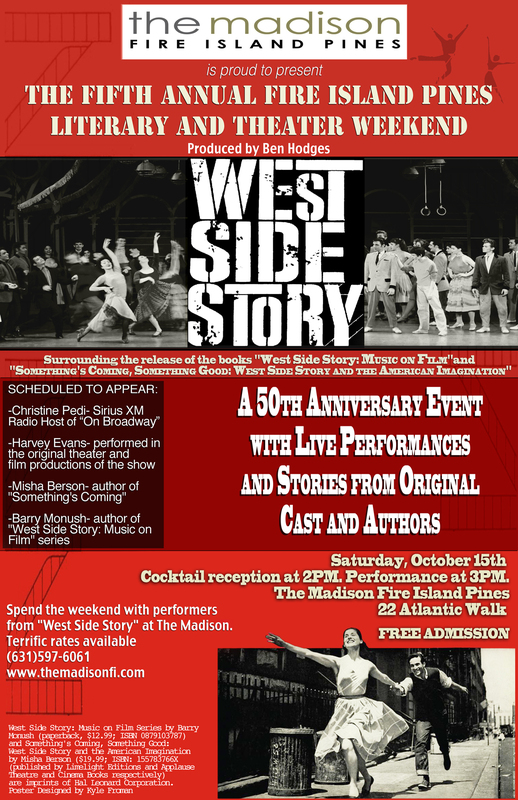 The 5th Annual Fire Island Theater and Literary Festival took place the weekend of October 14, 15, 16, at the Madison Fire Island Pines in Fire Island, New York, surrounding the 52nd and 50th anniversaries, respectively, of the stage and film versions of West Side Story. 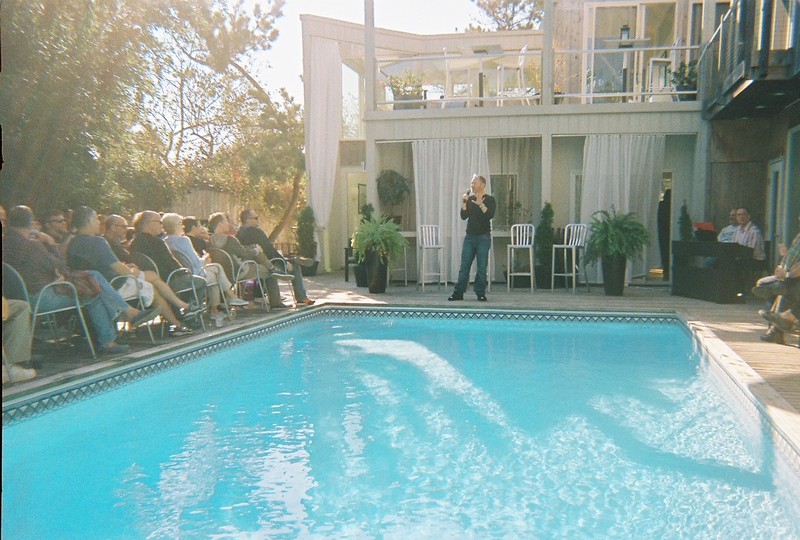 The event was hosted by Andrew Kirtzman of the Madison Fire Island Pines and produced by Theatre World editor in chief Ben Hodges. The event was hosted by Drama Desk-nominated Sirius Radio host Christine Pedi, who interviewed Applause Books authors Misha Berson (Something’s Coming, Something Good: West Side Story and the American Imagination), and Barry Monush (West Side Story: Music on Film). Original stage and film performer Harvey Evans was also in attendance. Selections from the show were sung by Bill Coyle and Patrician Noonan. Approximately 100 people were in attendance. Special guests: Harvey Evans (Broadway legend and performer of both stage and film productions of West Side Story), Christine Pedi (currently of NEWSical The Musical and SiriusXM radio host), Misha Berson (author of Something’s Coming, Something Good: West Side Story and the American Imagination), Barry Monush (author of West Side Story: Music on Film), and special Broadway performers TBA. Ben Hodges, editor of the beloved book series Theatre World, is proud to produce the fifth annual Fire Island Pines Literary and Theater Weekend on Oct. 14th, 15th, & 16th. The theme is West Side Story. Something’s Coming, Something Good: West Side Story and the American Imagination, by Misha Berson (Applause Books), and West Side Story: Music on Film, by Barry Monush (Limelight Editions) are new books from Hal Leonard Performing Arts Publishing Group. The event will be hosted by Drama Desk nominee Christine Pedi, currently of NEWSical The Musical and the host of the SiriusXM daily radio show On Broadway, with discussion/questions and book signing by Misha Berson, Barry Monush, and Ben Hodges to follow. Patricia Noonan recently created the role of Elizabeth Bennett in Jane Austen’s Pride and Prejudice in the New York Musical Theatre Festival (NYMF) and the role of Sophia in Death Takes a Holiday for the Roundabout Theatre Company. Other NYC credits: Where’s Charley? and Girl Crazy (City Center Encores! ), Signs of Life (Lorelei), Hurricane (NYMF), Cabaret Girl (Effie). Regional: Carousel (Julie Jordan/Barrington Stage), Sondheim at 80 (Soloist/Kennedy Center), Little House on the Prairie (original cast/Guthrie Theatre), How to Succeed… (Rosemary), Ragtime (Evelyn Nesbit), Man of La Mancha (Antonia). Training: Boston College (Presidential Scholars Program).